Like any new industry, the recreational cannabis market has been dominated by those with the capacity to meet demand and get their product offerings to market. But as the industry begins to mature, companies tackle startup headaches and move into full production, and retail competition distribution grows, marketing and branding increasingly become a critical component of any successful cannabis venture. Cannabis lifestyle brand Weekend Unlimited (CSE: POT, FSE: 0OS1, OTCQB: WKULF) already has a great sense of itself and a strong brand identity – its name was literally built around the idea of extending a sense of the weekend to any day of the week. The company received considerable media attention in January when it won a lottery for the Canadian Stock Exchange’s much-desired stock symbol POT, an event which will always be part of the company’s story. Weekend Unlimited’s executive team has a strong background in consumer packaged goods, branding, and an understanding that the modern cannabis consumer defies the time-worn image of the slacker-stoner perpetuated largely by those hostile to cannabis. The majority of today’s cannabis consumers are new to cannabis, come from professional backgrounds, are increasingly health-conscious and therefore receptive to new health and wellness options the industry offers, and recreational users are more interested in derivatives that allow them to enjoy cannabis without having to smoke flower. Research has also shown that women are up to 15% more likely to purchase and consume cannabis than men, and as the primary purchasers of health and wellness products, represent an even greater share of this rapidly-growing segment of the industry. They’re also interested in brands they can engage with. So as the industry becomes more established, those with the forethought to build strong brand identities now will potentially win the day, and at least one brand could emerge nationally, and perhaps internationally, and become synonymous with the cannabis industry. Armed with this understanding, Weekend Unlimited has re-imagined itself as a consumer packaged-goods company with CBD and THC-derived products and created an agile lifestyle brand identity to appeal to all demographics and distinguish itself from the competition. Weekend Unlimited CEO Paul Chu unveiled the new branding in New York (where the company has just established its global headquarters) during a March 20th presentation at CannaGather, the cannabis industry’s largest annual gathering. The first thing you notice about the brand’s design is how clean it is, resembling something from the cosmetics industry more than what we’ve come to expect from pot. 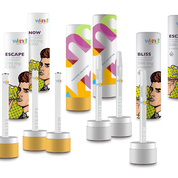 A play on the company’s name has been transformed into the brand “WKND!”, and much of the packaging features striking, playful graphic images designed to evoke the unique persona of the brand. The white-dominant packaging and pastel colours are sure to stand out from the dark colours and green-dominant branding favoured by most of its competitors. Rather than choosing product names that imply potency but don’t actually tell you anything about what you’re buying, each product is framed around its intended effect. For example, WKND! branded CBD oils carry names such as “Mend Extract” for healing and relief, Pain Remedy & “Energizing Elixir” which are pretty straightforward, and “Play Potion”, for lovers. Each individual WKND! product provides a story for consumers to engage with and lets them know exactly what kind of experience they can expect, making their selection a simplified, pleasurable experience. And as competition grows and companies are better able to target specific experiences, consumers will be looking for the easiest way to select products that satisfy their desires. In support of the WKND! brand, Weekend Unlimited plans to open its first US concept store in Long Beach, California in the second quarter of 2019. Half of the 5000 sq. ft. space will be dedicated to retail and focusing on the WKND! brand, while the other half will be a Weekend LIVE lounge and event space, which will feature community outreach and educational seminars, along with brand-centric promotional events. Weekend Unlimited Live, as its name suggests, is a live-event concept featuring exclusive concerts, music festivals, parties, destination travel, sports, charity and other special events to raise the profile of its product brands. In November, Weekend Unlimited added a 31-flavor edibles offering to its existing portfolio through the acquisition of California-based Canna Candys and Canna Medibles, brands which are well-known in the Southern California market. Canna Candys are a CBD-only edible, while Canna Medibles are infused with THC, and the company is currently developing several new edibles as well as a beverage line. The company plans a national distribution rollout of its CBD edibles line throughout the US, and THC edibles line in Washington, Nevada, and California – the world’s largest legal cannabis market – where its existing distribution in 380 retail stores will be further expanded. CBD-only deals are also being negotiated in New York, New Jersey, North Carolina, Texas, and Florida. Canna Candys’ new licensed manufacturing facility will be operational in Q2 2019, producing hard candies and gummies, and enables the accelerated development and production of new gummies, beverages, and other edibles. Weekend Unlimited’s edible THC + CBD production will come from California’s HDG facility. In January, the company closed its acquisition of Verve beverages, an established brand within the functional beverage market, one of the highest growth categories in the beverage industry. The acquisition enables Weekend Unlimited to advance its plans for infused beverages and enhances its presence in the highly lucrative derivatives market. Verve is introducing new beverage brands such as Champ Energy – already the official energy drink of the NHL’s San Jose Sharks – under its exclusive distribution license, plans to launch additional CBD-infused products, and has plans to grow its retail footprint through its distribution network and retailer relationships throughout the US. Legalization offers the cannabis industry an exciting opportunity to rebrand itself, and those like Weekend Unlimited who establish a strong brand identity now, and take a leading role in the effort to create a new image for the industry as a whole, should expect to do well as the industry continues to mature and expand.